Summary: The Palestinian Liberation Organization, which claims sovereignty over the disputed territories of the West Bank and Gaza Strip as the State of Palestine, will apply for U.N. membership this week. Meanwhile, the total number of countries recognizing Palestinian independence has grown sharply in the lead-up to the U.N. bid. the green areas "disputed territory". Map is my own work. Sources: Natural Earth, B'Tselem, U.N. OCHA oPt, others. Palestine is a unique case within the nation-state system. It is recognized as an independent state by more than half of the world's countries, but not by the U.N. itself or by any major Western powers. It indirectly administers much of its claimed territories, yet exercises full sovereign control over none of them. At the heart of one of the world's most intractable conflicts, it is perhaps the most controversial topic in international politics. The coming weeks could see significant changes to the political status of the Palestinian Territories on the world stage. 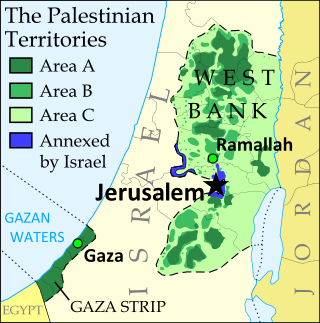 The Palestinian Territories are made up of the West Bank and the Gaza Strip, two regions previously controlled by Jordan and Egypt respectively, which were captured by Israel in the Six Day War of 1967. Israel has never fully relinquished control, and Egypt and Jordan eventually gave up their claims to the regions, leaving them in an unusual political situation. Despite widespread calls for independence based on a 1947 U.N. partition plan, Israel refuses to refer to them as anything other than "disputed territories" until negotiations determine their final status. Some of the land within the territories is now administered by the Palestinians, though much of it is still ruled by the Israeli military, which also controls all associated airspace and territorial waters. This week, Mahmoud Abbas, chairman of the Palestinian Liberation Organization (PLO), will formally request full membership for the State of Palestine in the United Nations. The PLO declared independence in 1988, and has enjoyed a degree of support from the U.N. General Assembly, but currently only holds observer status in the organization, which pointedly labels it as a "non-state entity". Palestinian membership in the U.N. is likely to be vetoed by the U.S., which holds a permanent seat in the U.N. Security Council. However, Palestine may still achieve "state observer" status by a majority vote in the General Assembly, which would elevate it to the same level as the Holy See (Vatican City): a U.N.-recognized state with legal rights. Countries recognizing the State of Palestine. Recent additions (in the last year) indicated in lighter color. Modified from this map by Alinor at en.wikipedia (license: CC BY-SA). Though 90 U.N. members recognized Palestine during the first year after its declaration, the number grew little over the next 15 years. However, since the campaign for U.N. membership began a few years ago, recognition has risen sharply. The State of Palestine is now recognized by 126 U.N. members - nearly two-thirds of the world body - 17 of which have announced their recognition just in the last year. This summer alone has seen six new additions: Syria, Liberia, El Salvador, Honduras, St. Vincent and the Grenadines, and Belize. Palestine's independence is also endorsed by Western Sahara, a partially-recognized state without U.N. membership. 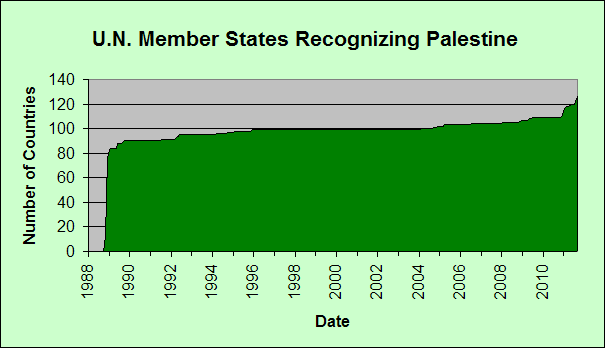 Chart over time of total U.N. members recognizing the State of Palestine. My own work (source).